The cultivation of oysters began more than 2,000 years ago when Romans collected oyster seed stock near the mouth of the Adriatic Sea and transported them to another part of Italy for grow-out. The Romans had such a passion for oysters that they imported them from all over the Mediterranean and European coasts. Oysters flourish in estuaries where nutrient-rich fresh water meets the salt water and feed mainly on single-cell plants. When feeding, the oyster can pump and filter 25 gallons of water in 24 hours. Florida's estuaries provide suitable conditions and a plentiful food supply for Eastern oysters (Crassostrea virginica) to grow rapidly. They can reach marketable size in less than two years; whereas, it may take oysters up to six years to reach marketable size in colder northern waters. When traveling along the Gulf Coast, you may see oysters being harvested commercially from small boats by fishermen using large, long handled tongs to scoop clumps of oysters from the bottom. Tender to firm texture, flavor varies from salty to bland. Extra lean. • In-shell oysters: 6 whole oysters per serving. • Live oysters should close tightly when tapped. • Discard any oysters that don't close; this is an indication that the shellfish are dead. • Live oysters should be free of cracks. • Oysters have a fresh odor when freshly shucked. • A clear, slightly milky or gray liquid should surround freshly shucked oysters. • Store shucked oysters up to five days. • Wash live oysters thoroughly under cold running water prior to cooking. • Steamed or grilled: cook until shell opens. 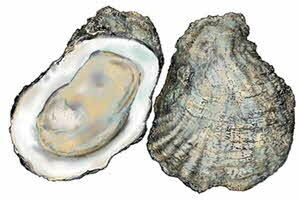 • Shucked oysters: bread and fry in oil for 3 to 4 minutes at 375 degrees F.
• Shucked oysters: bake for 10 minutes at 450 degrees F.
If you eat raw oysters you need to be aware that certain health conditions put some people at risk of serious illness or death and these people should not eat raw oysters. Vibrio vulnificus is a bacterium that occurs naturally in marine waters. It is not a threat to most healthy people, but Vibrio vulnificus can cause sudden chills, fever, nausea, vomiting, blood poisoning and death within two days in people with certain medical conditions. The presence of the bacteria is not a result of pollution or poor product handling. Eating oysters from "clean" waters or in reputable restaurants with high product turnover does not provide protection. Fully cooking oysters completely kills the bacteria, so you can continue to enjoy oysters in many cooked preparations. When dining at restaurants, order oysters fully cooked if you have one of the risk conditions. Eating raw oysters with hot sauce or while drinking alcohol does NOT kill the bacteria. • Stomach problems, including previous stomach surgery and low stomach acid (for example, from antacid use). If you are an older adult, you may be at greater risk of having these conditions than a younger person. If you are or think you may be in any of these risk categories, you should not eat raw oysters. If you are unsure of your risk check with your doctor.